Besides the fact that a “big enough” truck now costs more than most starter homes, the statement is simply untrue. Sure, a big truck with a big engine and heavy-duty transmission will allow you to pull more weight, but there is absolutely no way it can control trailer sway. The point at which the trailer is connected to the truck does not change, regardless of vehicle size. It’s a coupler mounted onto a spherical ball. The design is intentional to allow the trailer full freedom of motion. No matter what angle the tow-vehicle\trailer combo is on, the trailer remains attached. And aren’t we glad? If we put a stiff rod between the tow-vehicle and trailer, turning would be a bit difficult. The downside of that set-up is that the trailer is free to move as much as the tow-vehicle. If the trailer gets hit with a strong wind or the turbulence of a passing truck, it has to pivot on the ball. It must sway. Do I need to repeat that? The trailer must sway. It has no choice. Now to my point. 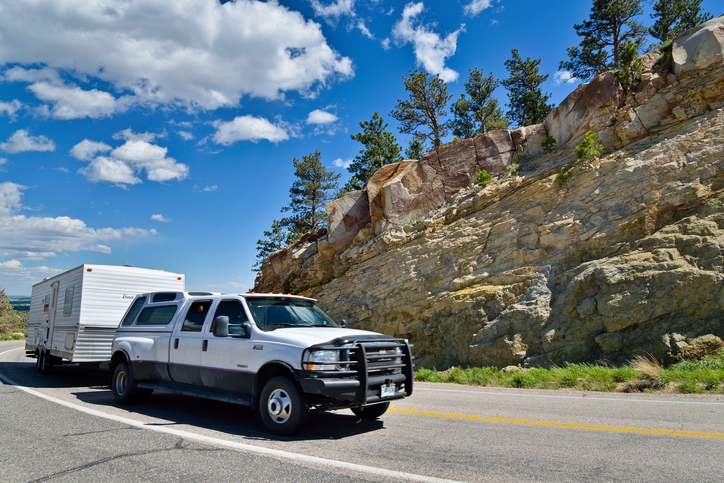 The only variable in your rig that matters is the connection point between the tow-vehicle and trailer. If it’s a round ball, the trailer will sway. If it’s a round-ball with one of the many friction sway-control hitches on the market, it will sway a little less, but it will still sway. So adding more weight to the front side of that connection accomplishes nothing. Maybe the driver will be blissfully ignorant of the swaying trailer behind him, but that trailer is still swaying. It has to. Physics is physics. Saying that a big truck will prevent trailer sway is like saying that a bigger tree will keep my tire swing from swinging in the breeze. That being said, folks, you still want the horsepower and transmission to pull a big trailer. Our friends in our controversial video like to experiment with extremes in order to prove that the Hensley does what it claims. If we’d used 3/4 ton trucks in that video, the credit would have gone to the trucks (because they didn’t read this article). What you need to understand, though, is that the truck is for pulling, not sway-control. You’ll notice that every trailer accident involves a truck or SUV. They had a “big enough” truck. Now it’s a scrapped truck and trailer. Hensley’s goal is to make sure you enjoy your trailer and spend time with your family, not sitting on a freeway shoulder waiting for emergency vehicles. Give us a call at 1-800-410-6580 to find out how we can make this summer stress-free. By the way, “proper trailer loading” is another favorite argument. I responded that one on our website here: Proper Trailer Loading.